In Atlantis the Reawakening, author Dave Hildebrandt reports that he didn’t really find the quaint and curious lost isle, it found him. Of course, the claims of “Atlantis found” over the past twenty-three centuries have been prolific. Here, there, and just about everywhere on the planet would be an accurate assessment of locations claimed to have been the lost Isle of Atlantis. The problem with every one of these largely circumstantial speculations and conjectural theses has been a lack of any empirical evidence to substantiate them. The beautiful thing about Dave’s discovery, is that Atlantis is exactly where Plato said it was, and perhaps even more illustrious than Plato could ever have imagined, and Atlantis The Reawakening provides all the proofs anyone could ever demand. Most latter-day analysts have long since considered the Atlantis in Plato’s dialogues Timaeus and Critias to be a fabrication by the ancient author, perhaps for purposes of entertainment as opposed to a true historical account. But Atlantis fans and exuberant lost isle theorists alike have not been so quick to dismiss the mythological tale theorists alike have not been so quick to dismiss the mythological tale as fictional, clinging to a hope the story is true and the splendor that once was Atlantis will someday be realized. Well, quite simply, it has. While the gold, silver, orichalcum (copper), and ivory once adorning them has long ago been plundered, perhaps by ancient Phoenicians or Egyptians, most of the pillars which once were the centerpiece of Atlantis’ Temple of Poseidon still stand. And this is only the tip of the proverbial ice berg of compelling intrinsic and empirical evidence to be gleaned from Atlantis The Reawakening. The hill not too steep on any side, the abode of Evenor, his wife Leucippe and Cleito their daughter who Poseidon would take for his wife, is right there about 6-7 miles from Poseidon’s temple at the center of the Citadel. And still there too, are the springs flowing with hot and cold water and the many other amenities Plato describes. And yes, the unique harbor with its concourse of land and watery proportions still remain, conforming almost perfectly to Plato’s metrics, providing smoking gun evidence of the lost isle. Even the smaller central island can still be witnessed, although the fabulous white and red stone clad colonnades which were the palace have obviously long ago been looted. But the evidence uncovered by Dave Hildebrandt’s research efforts goes far beyond the physical fixtures and parametric analysis of the famed lost isle. Incredibly, he succeeds in connecting the dots found in Plato’s dialogues and other ancient extra-Platonic text as well, developing strong clues connecting Atlantean culture with the cultures of ancient Egypt and the Greek’s Minoan and Mycenaean ancestors. Parsing Plato’s literal words, and with some help from Hesiod (who Plato often quotes), Dave meticulously explains Plato’s 9,000 years before his own time reference in more metaphorically duplicitous terms. But it would appear that the discovery of Atlantis is but one side of a figurative coin, flip it over and the solution to a second enigmatic mystery is revealed. And this one is simply mind blowing. Archeologists, anthropologists and others studying ancient prehistory are in for a treat. Not only is the realization of Atlantis probably the most significant historical discovery of all time, this secondary discovery warrants equal billing: what many would consider the two greatest prehistoric mysteries of all time have been solved. 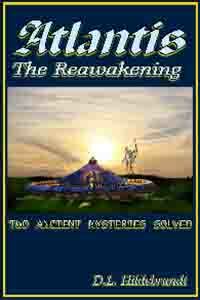 There is much more to tell and it’s all in Atlantis The Reawakening. And equally profound discoveries are sure to follow as investigators consider the ramifications of this awesomely profound discovery.